What do the front plank, overhead press, and pull-up all have in common? On the surface, not a heck of a lot. One is an “ab” exercise, another is an upper body vertical push, and the other is an upper body vertical pull. But if we take a closer look, we may just find some common ground after all. In the front plank, the long axis of the body is oriented at a right angle to gravity. If we were to relax in this position, gravity would pull our hips straight down, causing our low back to hyperextend, or arch. Good form, or not so much? The purpose of the plank, then, is to counteract gravity’s pull through a strong contraction of the abdominals and glutes. For this reason, you may hear the abs termed “anti-extensors” of the core and the plank an “anti-extension” exercise. So what about the guy or girl planking it out for minutes at time (typically while scrolling through their Instagram feed)? Are they squeezing their abs and glutes tight like they should be? Or are they relying on the passive structures of their low back (tendons, ligaments, vertebrae) to keep their hips off the floor? Take the woman pictured above, for example. Notice the curvature of her low back (accentuated in red for clarity). Without visual feedback or help from a friend, it’s quite likely she'll believe she’s performing the exercise correctly. It’s obvious from the discussion above, however, that she could stand to fire her abs and glutes harder to flatten out her spine. What About the Overhead Press and Pull-up? Now back to the original question: what do the overhead press and pull-up have to do with the front plank? The answer, it turns out, is actually quite a bit! 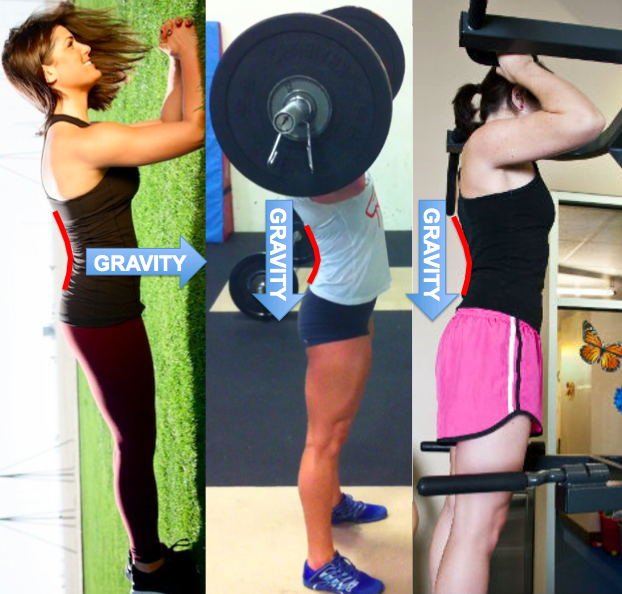 Although the body is oriented in line with gravity in the pull-up and press (as opposed to at a right angle), the pull of the body hanging from the bar and the weight overhead, respectively, also tend to hyperextend the low back (see picture below). Thus, overhead presses and pull-ups double as fantastic anti-extension core exercises. Planks, overhead presses, and pull-ups are ALL anti-extension core exercises. It’s for this very reason that some lifters don’t bother with exercises that directly target the core (like planks) at all. Instead, they opt for compound exercises that hit the core secondarily. Interestingly, the "nothing-but-compound-lift" strategy will indeed be suitable for folks whose core and upper body strength are perfectly matched. It won’t cut it, however, for anyone who tips the strength scale much in one direction or the other (core stronger OR weaker than upper body). The lifter with abs of steel but not much up top will be limited by the amount of weight he or she is able to press or pull. That is, their core will not be sufficiently taxed by upper body lifts because their upper body musculature can’t handle heavy enough loads to provide a stimulus to the core. On the flip side, there’s the lifter with the flabby midsection whose lower back hyperextends simply from raising their arms overhead or hanging from the pull-up bar. Their core is so weak (or their motor control so faulty) that just hanging (or pressing anything heavier than pink dumbbells overhead) causes severe compensatory patterns at the low back. Both the strong core and weak core populations will benefit from adding direct anti-extension core work to their training programs. In the case of the strong core gang, their best bet will be an advanced progression like an ab wheel roll-out or plate-loaded plank. They will also, of course, want to focus on bringing their upper body strength up to match their six-pack abs. The weak midsection type, on the other hand, must first learn to engage their abs and glutes properly, through either a regular front plank with proper cueing or perhaps even a regression to a bench plank. Wherever you fall on the core/upper body strength spectrum, always remember to squeeze your abs and glutes like you mean it -- be it in a plank, overhead press, pull-up, inverted row, or any other anti-extension exercise you can dream up where the spine must remain flat as the extremities push or pull around it. For more anti-extension core strategies, check out my post on "anterior pelvic tilt."